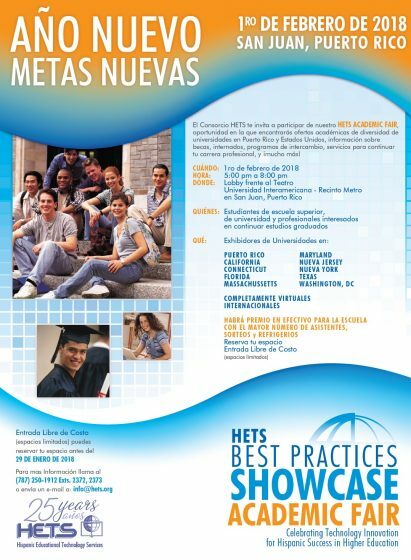 As an added value for our member Institutions, HETS provided a space to showcase their institutional Academic Offerings in the event: HETS Academic Fair 2018. More than 300 participants had the opportunity to learn more about studying opportunities and offerings of Higher Ed institutions from: Puerto Rico, New York, New Jersey, California, Connecticut, Florida, Massachusetts, Maryland, Texas, Washington DC among others. Who should attend: High school and college students, and professionals interested in continuing graduate studies. This Academic Fair was targeted to High Schools, undergraduate students, and professionals interested in continuing graduate studies from Puerto Rico. If you need more information, do not hesitate to contact the HETS office via email to info@hets.org or by phone at 787-250-1912 exts. 2373, 2372. Thank you for the unwavering support to HETS and its initiatives.